New Delhi, July 26 (IANS) The Union Environment Ministry has received total nine representations against the new cattle trade rule from the public representatives including the Chief Ministers of Kerala and Karnataka, parliament was told on Wednesday. 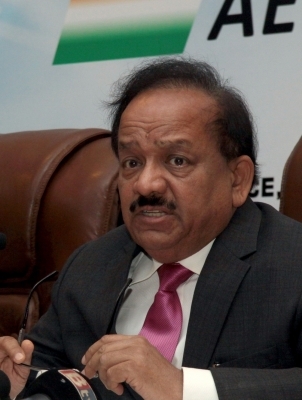 Among those who sent representations against the new rules were Kerala Governor P. Sathasivam and Chief Minister Pinarayi Vijayan, Karnataka Chief Minister Siddaramaiah, Pudicherry Chief Minister V. Narayanasamy and Meghalaya Governor Banwarilal Purohit, Environment Minister Harsh Vardhan told the Lok Sabha in a written reply. Others public representatives include the Revolutionary Socialist Party’s N.K Premachandran, Congress leader and Kerala’s Leader of Opposition Ramesh Chennithala, Congress’ Meghalaya leader Vincent H. Pala and Meghalaya-based National People’s Party leader Conrad K. Sangma, he added. “The Prevention of Cruelty to Animals (Regulatory of Livestock Markets) Rules, 2017 was notified in Gazette of India on May 23, 2017. The notification was stayed by Madurai Bench of Madras High Court… the Supreme Court vide order dated July 11, 2017 has also observed that the stay granted to the operation of rules shall apply to the whole country,” he said. The Environment Ministry modified the rules to prevent cruelty to animals, making it mandatory to ensure that cattle are not bought or sold for slaughtering. The list of animals that could not be bought or sold for slaughter through cattle markets included cows, bulls, buffaloes, heifers, calves and camels. The ministry later said that the animals for the purpose of slaughtering could be procured directly from the farmers at their respective farms. It also clarified that the aim was to regulate the animal market and prevent cruelty to animals. However, the enforcement was challenged, following a nationwide protest. The ministry had invited representations in May.